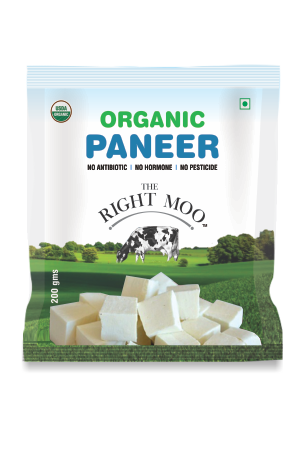 Paneer is an Indian cheese that is high in nutritive value. It is rich in calcium and protein and aids in many body processes. It also prevents tooth decay. If your kids develop a habit of eating paneer everyday, they will not suffer from tooth decay. Paneer provides instant energy to the body, a bite of cheese can act as your energy bar too. Hence, paneer should be part of your daily diet especially if you are a vegetarian as it fulfills protein need of the body. Made from milk untouched by hand from Holstein-Friesian cows fed Certified Organic feed. No Pesticides, No Urea, No Aflatoxin M1, No hormones, No antibiotics, No GMOs, No heavy metals. Amazing taste- sweeter in taste as cow is given more of green grass. Has high CLA, Calcium and Vitamin E.